The team that brought you a rendition of Gulliver’s Travelsnow turn their attention to another of those works by celebrated ancients who would surely be astonished (if not miffed) to find themselves adapted for unfledged youth. Unlike the satire which has always made for difficulties in dealing with Swift’s book, narrative expansiveness is the problem posed by Cervantes. Near enough a thousand pages of Cohen’s old Penguin translation are needed to take us through the multiple journeyings of the Knight of the Doleful Countenance with its numerous side-trackings and the interpolated stories that interrupt them, so that much clarity of purpose is demanded of anyone trying to take short cuts. 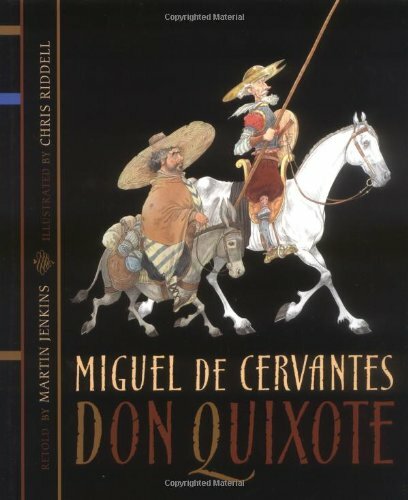 Both the writing and the powerful portraiture of the illustrations tend to support a view of Don Quixote as farce at the expense of an aged and knackered Romantic. That’s legitimate enough, for Cervantes was in no wise sentimental about his deluded hero, but among the abridgments for children I retain a preference for those by James Reeves and Olive Jones, with their illustrations by Edward Ardizzone and George Him, which allow sympathy and a muted sense of tragedy to creep in.